Headed to Europe to enjoy the wonder of the holiday season? Then read on as TPG International Correspondent Lori Zaino and TPG Contributor Lane Nieset share their picks for the most dazzling Christmas markets on the Continent. Prague’s Old Town Christmas Market. Photo courtesy of Shutterstock. 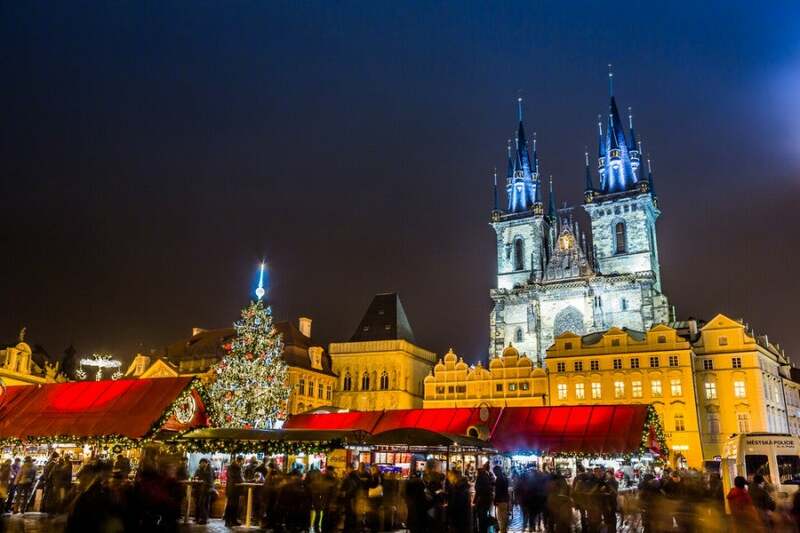 Set in Old Town Square and decorated with glittering lights and a nativity scene, Prague’s huge, festive Christmas market is one of the most famous in Europe – and quite possibly the cheapest. For about $4 US, you can enjoy a barbequed sausage, a delicious trdelnik (a Czech sugar-coated cake), and a cup of hot chocolate, a Pilsner beer or a glass of mulled wine. Purchase lace, toys, ceramics, candles, Christmas decorations or puppets at one of the many wooden stalls, and listen to the sounds of carolers and street performers as you inhale the deep scents of pine and spices. Kids will be delighted to pet baby goats, sheep and donkeys as well as visit the Three Kings. 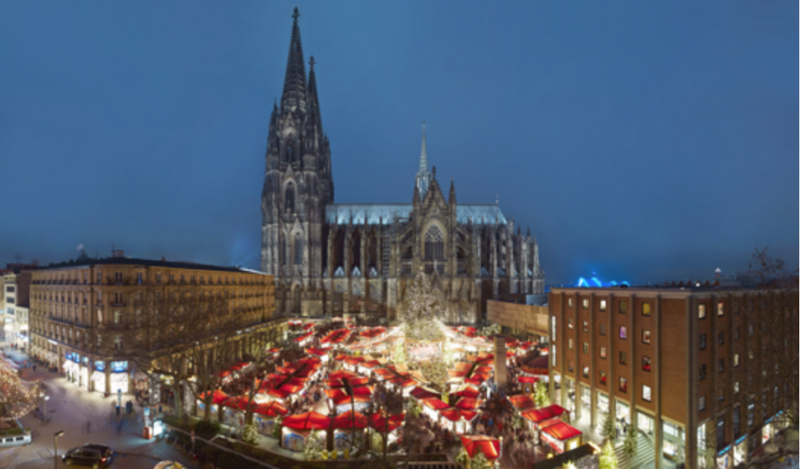 Swathed in bright lights and décor, the market’s beloved giant Christmas tree, imported from the pine forests of the northern Krkonose Mountains, is switched on daily at 5 p.m.
Christmas Market at Cologne Cathedral. Photo courtesy of Dieter Jacobi/KolnTourismus GmbH. Sunday-Wednesday, 11 a.m. – 9 p.m.; Thursday and Friday, 11 a.m. – 10 p.m.; Saturday, 10 a.m. – 10 p.m.
One of the largest in Cologne, this market is set under the city’s landmark Gothic cathedral. Its centerpiece, an 82-foot-tall Nordmann fir, is the largest Christmas tree in the Rhineland, lit up with 50,000 LED lights and located beside a stage that hosts 100 holiday performances troughout the month. The market also features 160 wooden stalls selling crafts like ceramics, Christmas ornaments, and wood carvings from Germany and other parts of Europe, as well as regional and organic specialties like the “Original Christmas mulled wine,” served in special mugs. Berlin’s WeihnachtsZauber. Photo courtesy of visitBerlin/Wolfgang Scholvien. 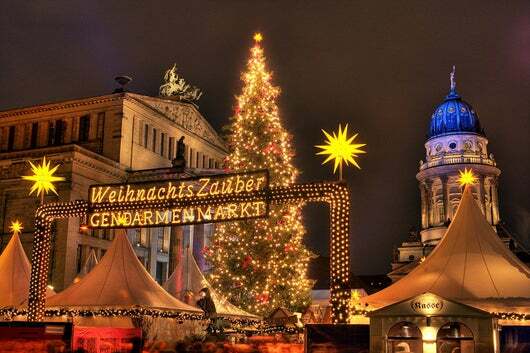 With 60 markets spread throughout Berlin, you’ll run into a Christmas-themed fête in almost any neighborhood. While some focus more on handmade crafts and others have carnival rides and ice skating rinks, one of the most beautiful markets in the city is in Gendarmenmarkt Square, tucked between the domes of the German and French cathedrals. While this market requires a small entry fee (1 Euro), it’s worth it to stroll underneath the sea of white, pointed tents topped with stars and more than 1,000 strings of lights. Of course the scene is especially stunning come nightfall, but this market is also a great one to visit during the day to explore the artisan goods crafted by jewelers, embroiderers, and glassblowers. Escape the cold in one of the heated tents with Michelin-starred chefs preparing meals, or sit back with a glass of wine and French food at Galeries Lafayette’s wine cellar. Don’t forget to get a glass of glüwein (mulled wine) and take home the souvenir mug. The largest in Switzerland, Basel’s Christmas market stretches over both Barfüsserplatz and Münsterplatz squares. Over 100 pine trees line the two squares, and there are over 180 wooden market stalls selling items like Christmas ornaments, folk art, pottery, linen, spices, toys, and clothing. Delicious aromas and live music waft through the market, creating a warm and friendly atmosphere amidst dazzling lights. Though this market has more of a focus on crafts and gifts, food and drink are still available. Manchester’s European Market in Albert Square. Photo by Mark Waugh. 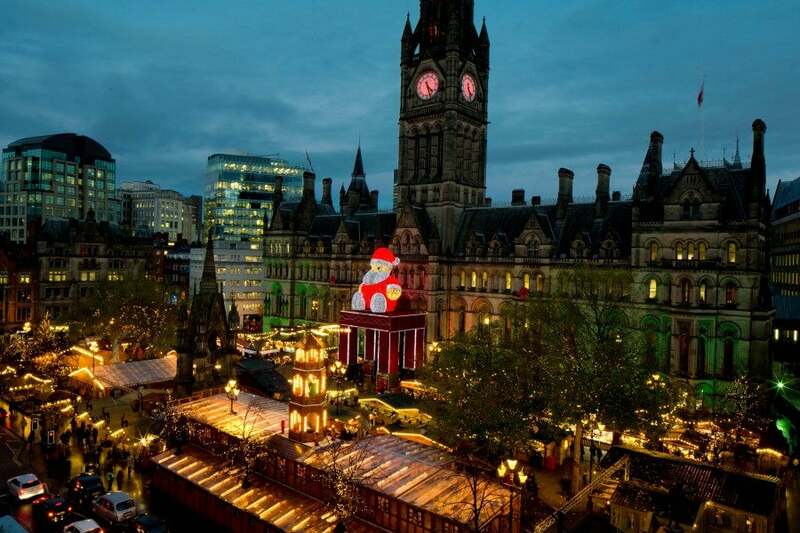 German: November, 10 a.m. – 7:30 p.m.; December, 10 a.m. – 8 p.m.; food and drink areas open until 9 p.m.
Manchester’s original market, the German Christmas Market in St. Ann’s Square, has been going strong for years. The event features delicious German fare like mulled wine, bratwurst, schnitzel and Bavarian strudels, and there’s plenty to shop for, including sheepskin products, paper lampshades, doorknobs, Christmas decorations, faux fur hats and scarves, and hot water bottles. The Albert Square European Market is the biggest in town, and you can find a wide variety of jewelry and leather goods, as well as gourmet foods from all over Europe, such as Dutch cheese, Italian nougat and panettone, French patés and Spanish charcuterie. Monday-Thursday, noon – 10 p.m.; Saturday and Sunday, 11 a.m. – 10 p.m.
Christmas Eve and New Year’s Eve, noon – 6 p.m.; Christmas Day and New Year’s Day, 1 – 10 p.m. The entire city of Brussels transforms for the Christmas season, and this year’s Winter Wonders celebration is honoring other cultures, with art installations from Quebec City, market fare from Lapland, and wrapped in one thousand lights and erected in the Grand-Place, a 72-foot-tall fir tree from Riga, Latvia, the city said to have been the first to decorate Christmas trees. 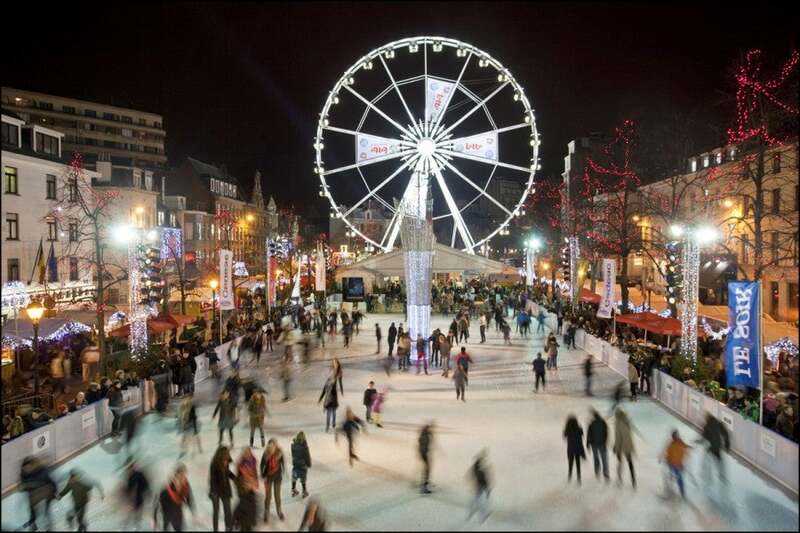 The Brussels Christmas market spans almost 1.5 miles and features 230 different chalet-style stalls filled with crafts, beer and wine, and holiday cuisine, as well as an ice rink in the Place de la Monnaie, a stage for DJ sets and dance shows, and a Ferris wheel and fair rides. 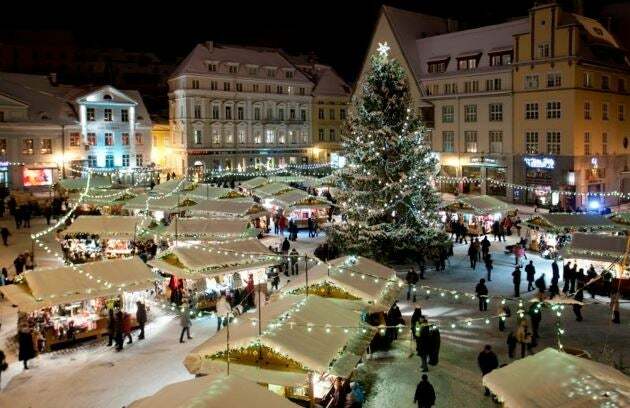 10 a.m. – 7 p.m. daily; drinks served until 11 p.m.
Tallinn claims to be the first city to have created a public Christmas tree display in Europe, set up in the Town Hall Square in 1441. Today the tradition continues in the same square, though now the tree is surrounded by more than 20 stands selling handicrafts and gifts such as wickerwork, quilts, wool items and candles, all of which can be gift wrapped for you on the spot. Kids will love the mini-zoo featuring rabbits, goats, lambs, geese, even reindeer, and they can also have pony rides, play games, and visit Santa. A full cultural program runs on Fridays, Saturdays and Sundays, showcasing song and dance groups and choirs from several countries. Feast on sauerkraut and black pudding, followed by some gingerbread and a hot glass of mulled wine as you admire the various intricate ice/snow sculptures. Montmartre Place du Tertre. Photo courtesy of Elise Bondel. The market running along the Champs-Élysées may be the largest one in town, but you’ll get the best views of the city from quaint Christmas village in Montmartre, known as the highest Christmas market in Paris. 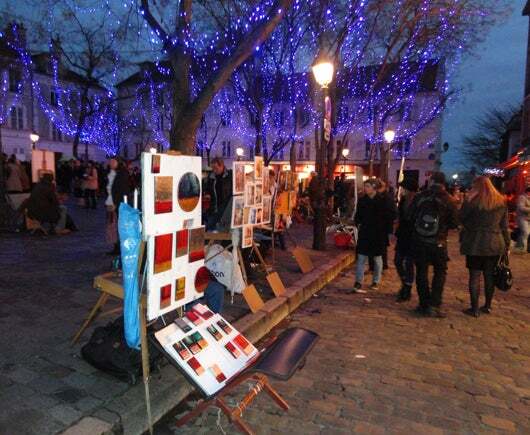 Stroll around the base of the Sacré-Cœur through the 50 stalls of traditional handicrafts and holiday fare like beignets, canneleés (pastries), and vin chaud (hot mulled wine).After grabbing a bite to eat at the market, make your way to the artists’ square, the Place du Tertre,filled with Christmas lights and artists working and selling their art. The smaller Place des Abbesses market, also in Montmartre, runs from November 28-December 31, featuring 20 wooden stalls surrounding the carousel selling gifts and holiday favorites like roasted chestnuts. Vienna’s Christmas Village at belvedere Palace. Photo courtesy of WienTourismus/Christian Stemper. Monday through Friday, 11 a.m. – 9 p.m.; weekends and holidays, 10 a.m. – 9 p.m.
What really makes this market stand out is its backdrop: the Baroque Belvedere Palace. Explore 40 stalls from vendors who hail from Austria and nearby countries, with six food stands serving up mulled wine, Austrian punch, traditional sweets and street food such as Kasnocken (cheese dumplings) and Vienna sausages. The market also features a carousel for the kids and music by gospel choirs, Austrian brass bands and tower trumpeters. 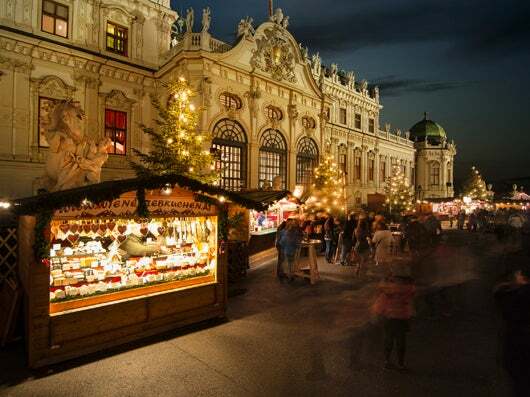 For a taste of Viennese tradition, visit the Old Viennese Christmas Market on Freyung, which dates back to 1772. The Ferris wheel at the Lille Christmas Market. Photo courtesy of Shutterstock. Sunday-Thursday, 11 a.m. – 8 p.m.; Friday and Saturday, 11 a.m. – 9 p.m. Located in Northern France, Lille is about an hour from western Belgium and only an hour-and-a-half from London on the Eurostar. 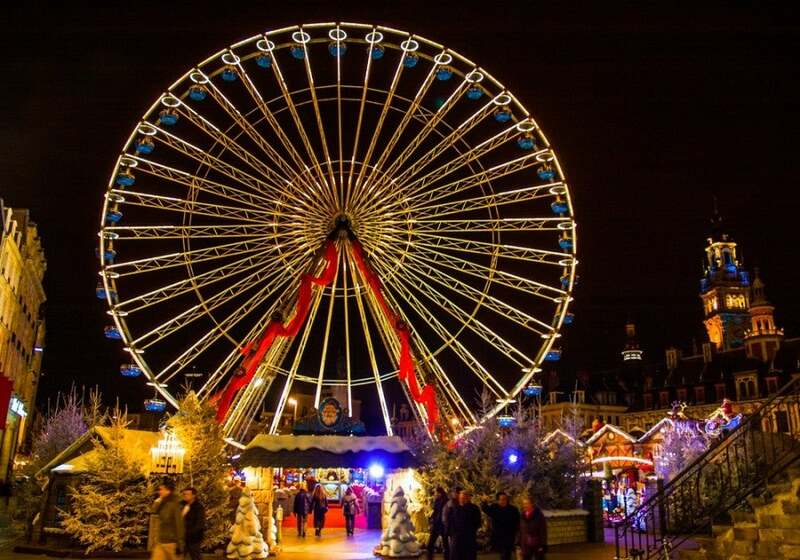 Set in Place Rihour, Lille’s Christmas market features a 164-f00t-high Ferris wheel, a 59-foot-tall Christmas tree draped in sparkling lights, and more than 80 wooden stalls featuring gifts, decorations and handmade goods. Chow down on French cheeses, pastries and mulled wine. Check out the Lille Tourism Web for packages including tours of the city and the market, plus hotel deals and mulled wine tastings. 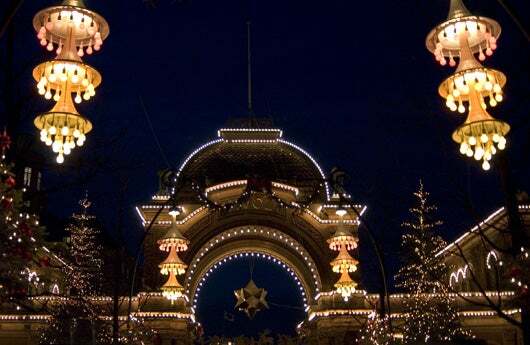 The Tivoli Gardens are a must-visit any time of the year, but winter is particularly special as the Christmas market and holiday celebrations take over the gardens and amusement park. Running through the center of the gardens, the Christmas market has 50 booths with traditional holiday gifts and food, including gløgg, the Nordic version of mulled wine. While you’re there, hop on one of the 27 rides, like the world’s oldest running wooden roller coaster, or catch a Danish version of the Christmas classic, The Nutcracker, in the Tivoli Concert Hall. One of the main highlights of Tivoli during Christmas will be the return of last year’s Nordic theme, with cute wooden houses and Christmas decorations. Don’t miss the Christmas Fireworks Festival running Christmas day through December 27 over the Tivoli Concert Hall. Set inVörösmarty Square centrally located in the Pest side of Budapest, the Christmas market has over 122 stands selling handcrafted leather and bone items, ceramics, jewelry and blue-dyed textiles, as well as gingerbread, chocolate, and lángos, a Hungarian street-food specialty composed of deep-fried flat bread dough topped with cheese, sour cream and garlic. The fair also features other Hungarian holiday favorites like stuffed cabbage, goulash soup, and kürtoskalács, a hollow pastry. If you happen to be collecting mulled wine mugs, the market has three different red and white mugs for sale along with the hot drink. In addition to tasting the local cuisine, check out some of the shows taking place on the market’s two stages, or hop on the vintage merry-go-round decorated with folklore from the Brothers Grimm and Hans Christian Andersen. 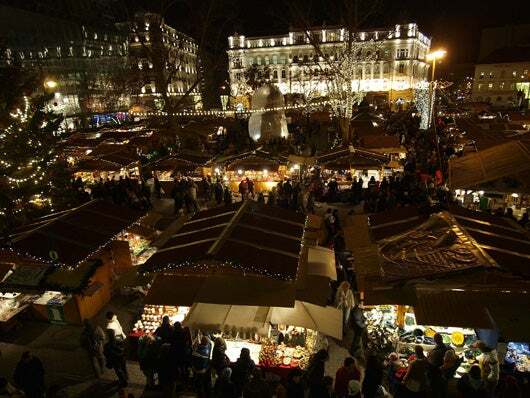 Wherever you’re headed in Europe this season, we hope you have a magical time at the markets!